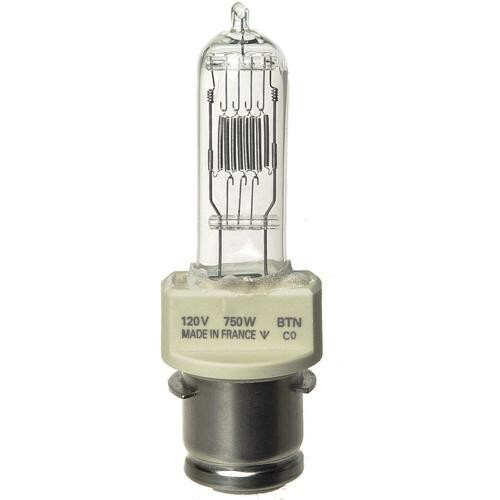 This Ushio BTN Lamp (750W / 120V) is a tungsten halogen bulb for theater, film and stage equipment. It has a color temperature of 3,050K and a lamp life of 500 hours. Box Dimensions (LxWxH) 4.8 x 1.5 x 1.5"
BTN Lamp (750W / 120V) is rated 5.0 out of 5 by 1. Rated 5 out of 5 by CW from Tops in My Book I trust Ushio bulbs more than any other. I do lots of field work and don't want to futz around changing bulbs after little bumps. Usio's been my go to bulb for decades.